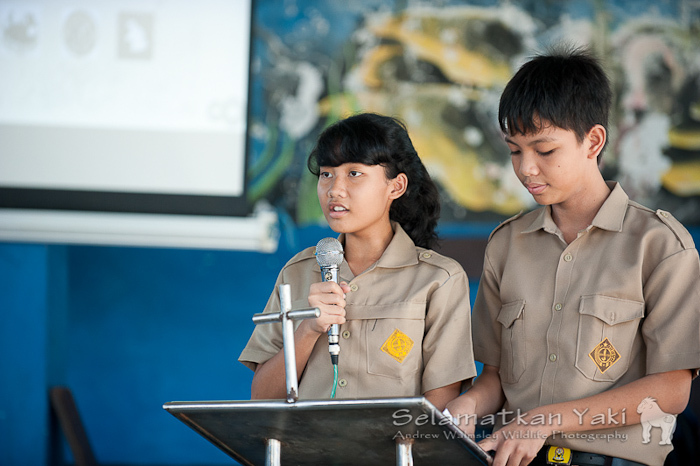 “What can I do to save yaki?…” The question that I have heard a number of times now, carefully articulated in English from young Indonesian students as they beam at me from amongst their excited school mates. So, how can we find an answer?….well, at first consideration it is certainly challenging – how can this youngster make a difference? But as you spend longer working in conservation, you realise the inherent importance of the younger generation, and the true difference that these guys can make. A positive attitude towards the environment, fuelled by a knowledge and appreciation of the distinct and unique natural world that surrounds us, is incredibly powerful. It is they who act as role models, enabling a wave of awareness to spread, in this case holding the potential to shift popularity from consumption to conservation. Facilitating those fine threads of knowledge, that transform into awareness, developing into the potential for real changes in behaviour; eventually fostering a deeper connection to the natural environment in order to develop greater incentives to conserve it. “But what about the problem of eating yaki.” A good one this one….a pondering of utmost importance, and ultimately what we are trying to work on to prevent the loss of this wonderful species to the dinner plate. People here mainly eat monkeys as a delicacy, not for subsistence. One must realise that there is no easy answer, that the situation is complex and requires far-reaching cooperation and an understanding at many levels. But the reasons not to eat yaki are relatively simple…if you care to liken the understanding to a series of connections: Firstly, aside from the fundamentals of animal rights and welfare, of consideration of their inherent value and sentience, of why yaki are important….integral to ecosystem functions, seed dispersers and representing an iconic species drawing international interest. Then an explicit realisation must be sought that we are attempting to protect yaki’s forest homes; if we protect the forests we safeguard a multitude of other species, the diversity of life, including the big, but slightly less hairy primates – people. Communities around the world, not only those living directly within and around forests rely on them for ecosystem services, for protection against erosion, natural disasters, for water preservation, for food, medicines, and in the bigger picture, to ensure that we halt the escalating risks of a global disaster caused by climate change. 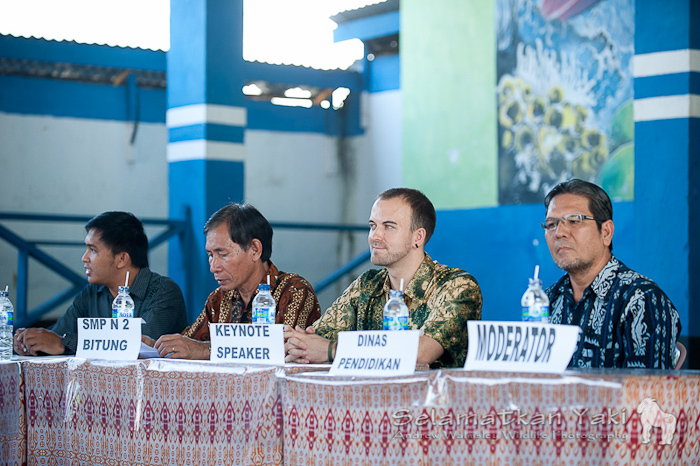 Last week I found myself attending a lively outdoor seminar in Bitung, a city of conservation importance as the main hub of wildlife trade and holder of the Tangkoko Nature Reserve. 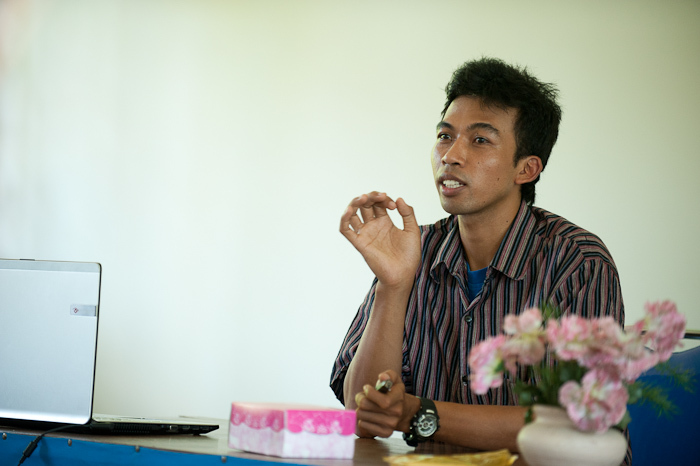 There is no simple recipe for conservation, and education and awareness raising is just one element of a strategic approach needed to tackle the issues. But spreading the conservation message throughout the region is an integral part of our work, and the images of this post highlight some of our recent visits to schools, seminars and events that all act to gain our support for our conservation work and empower the next generations to live more sustainably. We are currently looking into a potential eco-school programme in one school to act as a pilot project to implement environmental awareness into the curriculum. I see hope in the these fresh young faces, and I believe that once sufficient incentives are acknowledged, supported by direct threat reduction such as enhanced law enforcement, that we can truly safeguard the future of the crested black macaques.